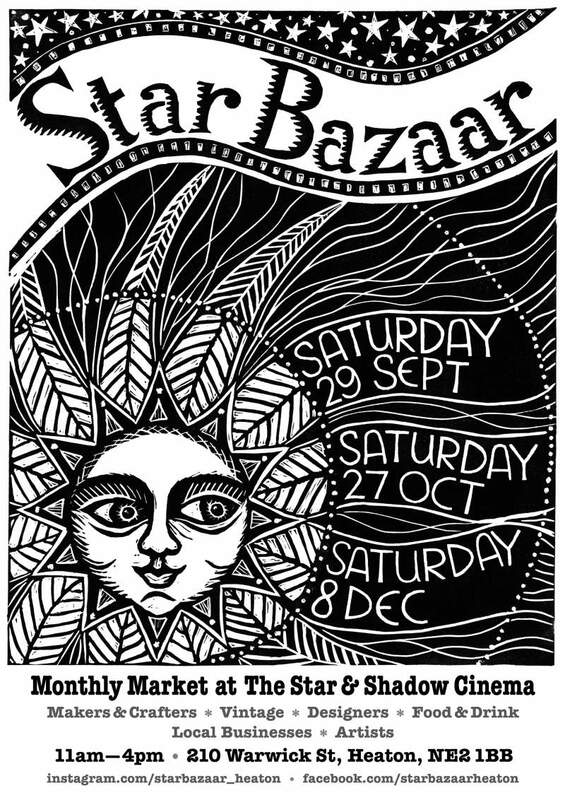 New monthly market Star Bazaar at the Star and Shadow Cinema in Heaton starts on Saturday 29th September, with subsequent markets taking place on Saturday 27th October and Saturday 8th December. They were kind enough to give us five reasons why you definitely need to attend. • It’s based in Heaton – a new asset for Heaton and its fantastic community. • It gives the people of Heaton a great new shopping opportunity – a kind of monthly pop-up department store offering a wide range of interesting original items, made and sold with love: bread and cakes, T-shirts, vintage items, musical instruments, potters and local artists, sewers and crafters. • It’s an opportunity to support local artists and businesses. • It raises awareness of The Star & Shadow Cinema and café, a brilliant community venture built and run by local volunteers. • It’s a long term project that will evolve to reflect the interests of local people and kindle a greater sense of community. • The venue is easily accessible – the number 1 bus stops just outside the Star and Shadow, both going to and from Newcastle city centre, along with free parking available on Warwick Street and nearby streets.